Baldwin Industrial Systems advises customers to ensure correct pump selection based on the wastewater treatment objective. Pumps are a critical component of the industrial wastewater treatment process where the use of an inappropriate pump type on a wastewater stream can lead to ineffective treatment. The wrong type of pump can also lead to shorter pump life and poor system performance. 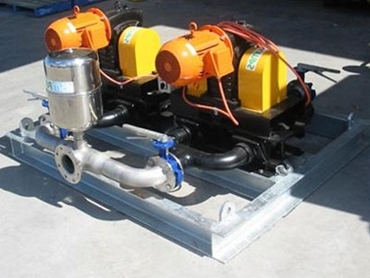 Baldwin Industrial Systems therefore, carefully choose pumps for each application after customer consultation and consideration of the total treatment objective. For instance, positive displacement pumps are recommended for coalescing plate separators to help minimise any mechanical emulsification that may occur with oil in water during pumping. Therefore, the correct pumps for oily water transfer to equipment such as coalescing plate separators, or between sumps where an oil skimmer is going to be used, should either be diaphragm pumps or progressive cavity pumps. Processes involving the transfer of water to wastewater treatment systems that are utilising chemicals to treat the water such as Dissolved Air Flotation (DAF) or Baldwin RM-10 units, are generally less sensitive to pump type. Often these systems require higher flow rates, requiring the use of air diaphragm pumps, progressive cavity pumps or centrifugal pumps. Baldwin offers a wide range of pump types to suit each application. Equipment and options available with pumps sourced from Baldwin Industrial Systems can include wastewater treatment equipment; pump skid; pipe spools; control panel; valves, actuators and solenoids; and dosing equipment.